Amanda is amazing. I gave her a photograph and she did even better. Amanda is so talented! Every bridesmaid loved their hair and went above their expectations. Amanda can do any hair style with any type of hair. I highly recommend booking her and Brittany. Brittany does amazing makeup and will make sure you look gorgeous. Their both great to work with! You have to book posh salon for your wedding!!! As a makeup enthusiast, I was a bit undecided if I was going to have my makeup done for my wedding or do it myself. I decided to do a trial with Posh Salon since my bridesmaids would need hair and makeup anyway and Posh was highly recommended to me by our wedding planner. Not only are Brittany and Amanda extremely talented, but also super professional and just plain FUN to hang out with while they work! Brittany’s makeup for my wedding day was absolutely flawless and did not budge, despite extreme downpours the day of! My makeup looked fresh and dewy well into the night. Brittany has the ability to listen to her client’s concerns and suggestions and turn them into pure perfection! My sister just got married last year and wished she knew about Posh Salon for her own wedding, because she loved her hair for my wedding more than her own! Amanda listened to her concerns about her hair and suggested extensions which made all the difference for her! Not only that, Amanda went the extra mile and selected them for her when my sister felt overwhelmed by the color matching process. 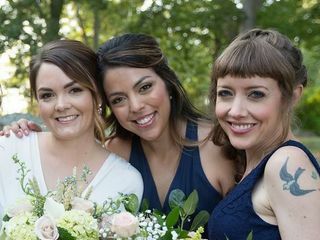 I’ve never seen any of my bridesmaids look more gorgeous than they did that day – one of my most finicky girls said it was the best makeup she’d ever gotten done! Cannot recommend highly enough. Amanda did such a beautiful job on my hair and my bridesmaids’ hair. She understood the feel of the wedding and made suggestions for my bridesmaids styles. She even accommodated me and squeezed me in for some last minute highlights days before the wedding while still keeping my hair natural looking. I could not recommend her more! Posh salon did a fantastic job with my wedding hair and makeup! They did my entire bridal party and were fantastic. Everything was perfect and everyone was beyond happy with how everything came out. The communication from them was awesome, the trails went well and the big day went even better then I could have imagined. I can't thank you enough!!! I had a wonderful experience with Posh Salon for my wedding! Brittany from Posh was so easygoing and nice to work with, and helped me find exactly the right hairstyle at my trial. I loved how my hair turned out on the day of the wedding (and it stayed put, even though it was pouring rain all day). Plus, she brought along a coworker to do the hair of my 8 bridesmaids, mom, and mother-in-law that morning, and everyone was so happy with how their hair turned out, too. Posh was efficient getting through that many people, and took great care of everybody. I highly recommend them. Amanda and Brittany made me feel so beautiful for my wedding. I looked and felt like a movie star. My makeup was absolutely flawless. The airbrushing made my skin look like porcelain, and I loved how the eye makeup accentuated and opened up my eyes. My hair was equally glamorous, just exactly the classic Hollywood styling I was seeking. Not only that, but these two ladies worked incredibly quickly. They had me looking my best nice and early so I could do pictures. Posh Salon also did the hairstyles for mother and my bridesmaids (french twists) and all of them looked incredible. Plus, the hair held really well all day--no stray hairs or anything coming loose, even with lots of dancing. I honestly could not have been happier with my experience. Brittany and Amanda took such good care of me and really listened to what I wanted. They were so accommodating and sweet...and they trekked through a bad snowstorm to get to the wedding. I feel so lucky to have found them. They were awesome! Amanda did all of my bridesmaid's hair on my wedding day and each and every one of them loved how their hair turned out. Amanda was awesome, easy to talk to, and very professional. The salon was really easy to work with all along in the planning process and very responsive when I had questions or needed to change our start time. I definitely recommend Posh Salon for wedding hair services! Everyone's hair looked amazing at my wedding! I didn't have a single complaint from either of the moms or my 10 bridesmaids. My only critique is that they left before I could do a final touch up after I put on my dress. I think that was just miscommunication, though. I would 100% recommend Amanda and anyone else from Posh, they were really great! We had Amanda and Brittany for our glam squad for our wedding at the Branford House on 4/23. I am SO glad we went with Posh Salon - they were amazing. The girls came to the venue to do mine and my 5 bridesmaids hair and makeup the morning of the wedding. They were prompt, professional, and friendly. I was actually amazed at how fast everyone's hair and makeup got done, and they did such a fantastic job! All of my bridesmaids were so happy with their hair and makeup, and I even had a few friends ask who we used, so they could pass it on to friends/family getting married. Prices are fair and quality of work is really amazing. Loved that they traveled to the venue for a small fee as well. I would definitely recommend Posh Salon to anyone getting married in the area! Thanks Amanda and Brittany!! Amanda was an absolute pleasure to work with and a calming force on such an anxiety inducing day. At the trial she said something that made me feel confident that we would work well together--she said "this is about building trust, not picking the perfect hairstyle." She assured me she could execute any hairstyle I wanted on the day of my wedding, knowing that I might change my mind a few times before the event. On the day of, she was a lot of fun to work with and totally open to making slight tweaks to get it right. She was also willing to work on-site rather than in her salon, which I would recommend to anyone getting married (it's so nice to stay in one place and not have to run around). She was able to give both me (~30's), my sister (21), and my mother and mother-in-law (50-60's) great looks that worked for all of our ages and personalities. I would highly recommend Amanda for both wedding hair and regular hair services. Just before my big day, she colored my hair beautifully and indulged me as I asked a bunch of questions about hair options for the wedding. Thanks, Amanda! We were so impressed by Amanda’s amazing talent to create so many different styles so quickly. I would imagine a bride plus 9 others was a long day, and Amanda did such a wonderful job with each and every one of our group. 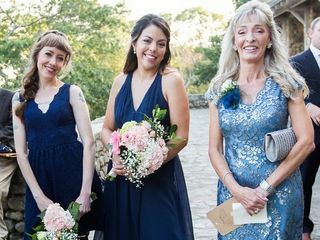 Everyone was commenting with how much they loved their hair styles – from the blow outs for the moms to the complicated “Elsa” (Frozen) hair style for the junior bridesmaid. Amanda put everyone in the group at ease, and made the getting ready process very enjoyable and fun. I can’t thank you enough for the wonderful day and stunning hair styles!!! I booked Amanda for our hair and Brittany for airbrush make-up. They did a fantastic job! The whole bridal party is still receiving compliments on how wonderful they looked! Would definitely recommend! I booked Amanda and Renee for my wedding day. They did a beyond amazing job!! I had 10+ girls in my bridal party/mothers/me that needed make up done and 13+ girls " " that needed hair completed. Amanda and Renee started hair and make up at 9 am and worked continuously throughout the day, with smiles on their faces, until every one was complete. My hair and makeup, along with my bridal party/Mothers hair and makeup were beyond words. They did such an amazing job not only with hair and makeup but also kept everything light, up beat, and super complimentary. I love them and will use them for any kind of event, regular hair maintenance, and cannot wait to see them again! Amanda and Renee you are TRULY fabulous and I will definitely recommend you everywhere I go!! Knowing that I had Amanda and Sidney from Posh Salon to make me and the women of my bridal party, Moms, and Aunts look and feel fabulous meant that I didn't have a thing to worry about! I had started working with Amanda for my regular haircuts in advance of my wedding and she did an amazing job doing my hair for my engagement pictures. I just knew I was working with the best! I never even did trials! We just have a relationship where I can walk in and explained the feel of the day and trusted in Amanda. She styled my hair in a way that accentuated my best features, took the weather into account, and made me feel so beautiful and confident. Plus the styles always hold up! Amanda is truly a talented hair stylist. On the wedding day she was quick and efficient with time of while still paying attention to the the small details and styling everyones' hair in the most flattering and beautiful way. My entire bridal party commented about how much they loved their hair that day. I will definitely continue to go to Amanda at Posh Salon! I am so happy that I had her as a part of my special weekend! Brittany and Tara were absolutely amazing. I live in Boston and so found Posh online. I went with them since their pricing is more then reasonable and they travel to your getting ready location. I never went to Posh and so wanted to schedule a hair and makeup trial but it didn't work out with my work schedule. It was not necessary though. I came in with some photos that I found on Pinterest, which I showed to both Brittany and Tara and they created looks based on the photos but that fit my face shape and dress. I felt incredibly beautiful and pampered and my hair and makeup stayed put the entire night! I very highly recommend them!! I can't say enough great things about Posh Salon! I booked Amanda for my recent wedding, and am so happy I did! Amanda brought another stylist, Renee, with her, and between the 2 of them, they got my entire bridal party and some family looking AMAZING for my wedding. Amanda is great at taking all of your ideas, and blending them together to make the perfect hairstyle. We all sort of knew what we wanted but weren't totally sure... she worked with our face shapes and hair types to make each girl look and feel beautiful. My hair plans changed due to the weather, but Amanda went to work to whip up the most perfect hairstyle for me- something I never would have imagined I would like!! It was so much better than anything I thought up on my own. She made me feel so beautiful, and was such a doll to be around. She came prepared to work, but had everyone laughing and having a blast at the same time. She was an integral piece of our happy and amazing day! All of my bridesmaids couldn't stop talking about how much they loved their hair & we are so happy we booked with Posh salon! They will travel to you or you can go to their adorable salon in Niantic. Highly recommended! I am very happy I booked Posh Salon for my wedding. They drove all the way out in the country and were there on time. Amanda and Brittany were great to work with from day one. Always responsive and very flexible with my indecisiveness. Not only did they both do amazing work but they were fun to be around. Definitely the type of personality you want surrounding you on your wedding day. I wore my hair down and my bridesmaids wore it up. Both came out gorgeous. Very soft and romantic and they stayed all night! I was not getting married close to home so I had to really search all over CT for a hair stylist. I am so happy I found Amanda and would highly recommend Posh Salon to all brides! I cannot say enough great things about Amanda. HIGHLY recommend! Amanda did the hair for a friend of mine’s wedding, and all of the bridesmaids raved about their hair at the wedding, and I knew I had to use her too. Amanda is so nice and friendly, she got along great with all of the ladies in my bridal party (moms included). 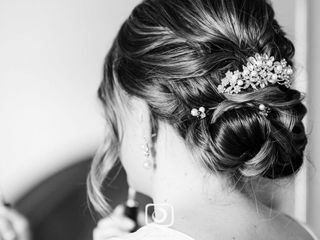 A few of my bridesmaid’s had bad experiences in the past with having their hair done in other wedding’s and were very hesitant about getting their hair done for my wedding. After Amanda was done with them, they were glowing. One of them had even said “I think I found the hair-do for my wedding”. 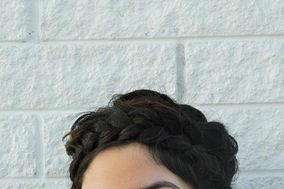 Her up-do’s are so unique, and she does not use 10 pounds of hairspray like other hairstylists. She listens to what you want, and will check in with you to make sure that you like what she is doing. I wore my hair half-up, half-down and curly and my curls stayed in all day and they looked amazing. Her prices are very reasonable and she was great to work with. Definitely use her for your wedding! The team at Posh Salon was wonderful! I had a big wedding party of 14 girls and they were able to accommodate everyone and worked efficiently. We had asked for an additional person to help just a few days before the wedding, so that the start time will not be so early, and they were able to accommodate this. Amanda did an excellent job with my hair and Brittany did an amazing job with my make-up! Everyone in my wedding party was happy with their work. Finding a hair salon team that was willing to work on site and on a Sunday was quite a challenge, but we lucked out when we found the Posh Hair Salon team located in Niantic, CT. Not only did they handle the challenge of a large bridal party, but they did it with excellence. Everyone's hair looked amazing, one of the bridesmaids even commenting how she wish they could have done her hair for her prom which was the night before because it looked so good. They were able to stick to a tight schedule and everyone was finished and ready to go on time. Rene and Brittany did hair for my bridesmaids, mom and me for my wedding on October 15. They were both absolutely phenomenal - added great, relaxed vibes to our morning and turned out girls' hair SO quickly. We were all shocked how quickly they were able to speed through everyone and how amazing our hair all turned out. As an example, Brittany came between the hours of 8 and 10am to help out and she did 5 girls' hair during that time and Rene was able to squeeze in our junior bridesmaid who decided to get her hair done at the last minute and made sure everyone got the adjustments/touch-ups they wanted with plenty of time to spare before photos. Having been in weddings where we run behind with hair/makeup, it was so incredible to have been so safely ahead of schedule the whole time! The only issue I had was that after I had my hair trial over 4 months before my wedding, they sent me the invoice and I didn't read that I had to turn it back into them within a week with a deposit to secure the date (and it was published only in print on the actual invoice attachment, not clearly in the email in my opinion). When about a month or so later I went to send them the deposit, they informed me of the policy and that they had booked another wedding. I thought it was extremely disappointing that they didn't reach out to me for either a check-in/reminder 7 days later OR for a first right of refusal when the other wedding came up, since I had already traveled from out of town to complete (and paid for) a trial AND had my hair and makeup done for my engagement photos by them as well. However, when I expressed this disappointment, they quickly did everything they could to accommodate me for the wedding and it all turned out perfectly. I would definitely recommend them to anyone in the area - it seriously was so amazing to be so ahead of schedule and everyone looked amazing! Thank you Rene & Brittany!